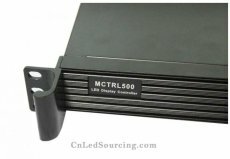 We will ship MCTRL600 if you place the order. NovaStar MCTRL500 has been replaced by MCTRL600. Please buy it accordingly. The price is the same. MCTRL500 is NovaStar's first LED Screen Main Sender Box, also known as LED display controller. You can control the LED display screen without any computer connected. 1. 2 DVI interfaces for cascade (video input and output). 2. Audio input interface integrated. 3. Optional data output interfaces (4 RJ45 Ethernet ports or 4 optical fiber ports) to scanbords (receiver cards). 4. RS232 serial ports for cascade instruction communication. Good product, thanks again for your kind support! Thanks again, Lucy...Very nice controller, it is highly recommended!! !